One of the challenging aspects of determining the storm type in Cyclone Center is the inability to view a storm snapshot in context. While classifying a set of images, you do not know which storm you are viewing and how that storm had been evolving before those times shown to you. 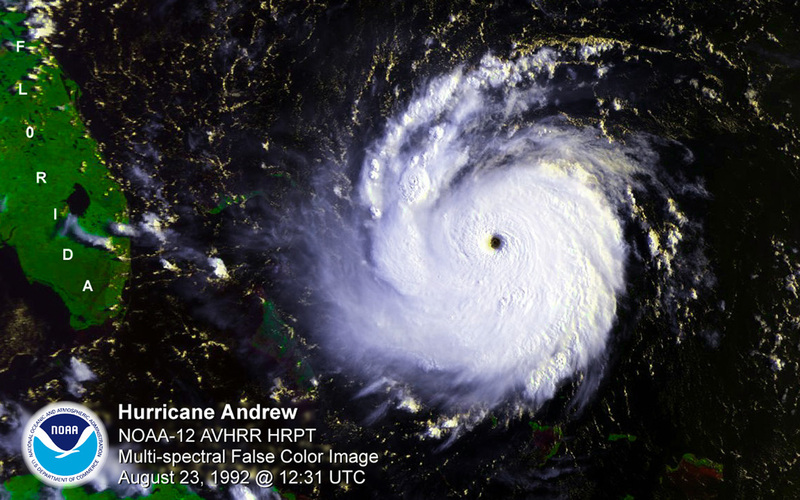 This can lead to images that can be misleading to classify – one such image is the “false eye” storm. A false eye is a circular feature of warm cloud that at first glance appears to be a genuine tropical cyclone eye (the center of a powerful tropical cyclone). Since we cannot look at other times during the process to see if the feature persists, we must look for other clues to determine if the feature really is an eye or not. 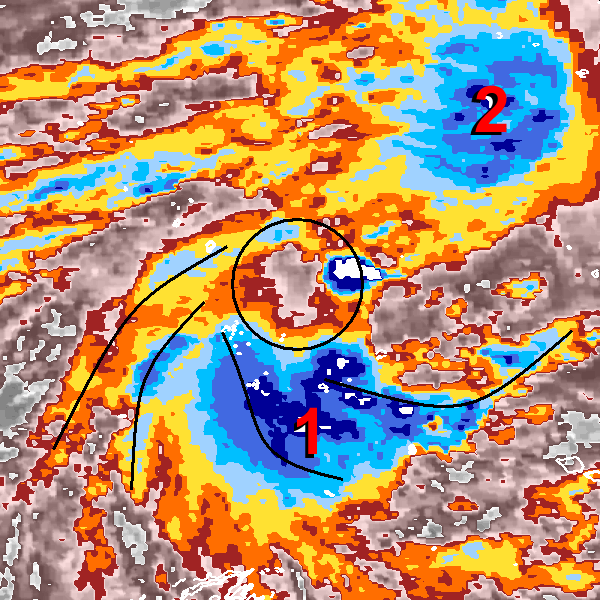 The primary thing to look for is the storm structure outside of the suspicious eye. Does the storm look well organized? Are there distinct and tightly wound spiral bands? Are cloud tops very cold or not so much? Consider the following examples, all examined and discussed in the Cyclone Center Talk feature. The black circle indicates where an eye could possibly be analyzed. But look at the cloud patterns outside of the “eye” for confirmation. 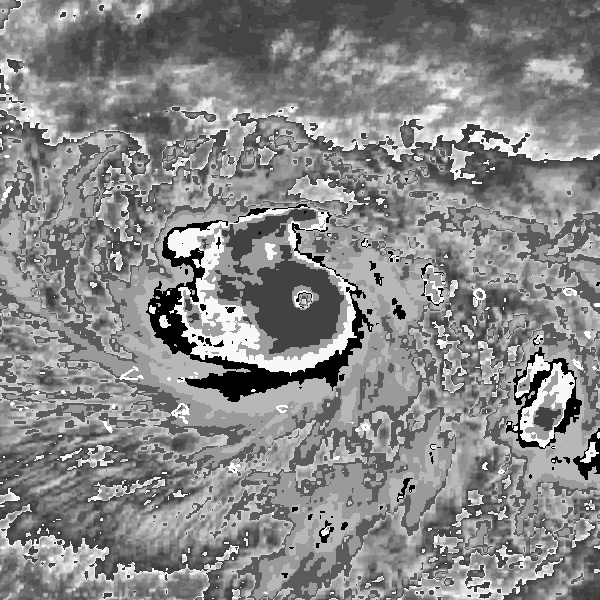 Here we see no organized spirals and no circular eyewall (the cold ring the typically surrounds the eye). The clouds are certainly very cold, which is sometimes an indication of strength; but the overall lack of organization leads me to conclude that the “eye” feature is actually just a gap in the cold clouds and not really an eye at all. 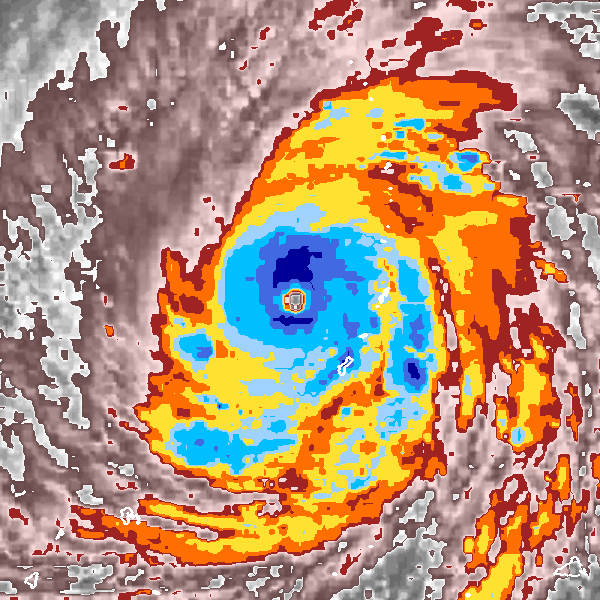 I would probably classify this as a weak spiral band type pattern, but nothing more. The second example is from a very complicated cloud pattern, typically seen in what meteorologists call the “monsoon trough” region. This is an area where the ocean waters are very warm and atmospheric winds tend to come together in the lower atmosphere, creating a situation that is quite favorable for thunderstorms and sometimes tropical cyclones. The black circle again indicates a circular area of warm clouds that may be mistaken for an eye. What I immediately notice is that there are two distinct areas of thunderstorms, labeled “1” and “2”. 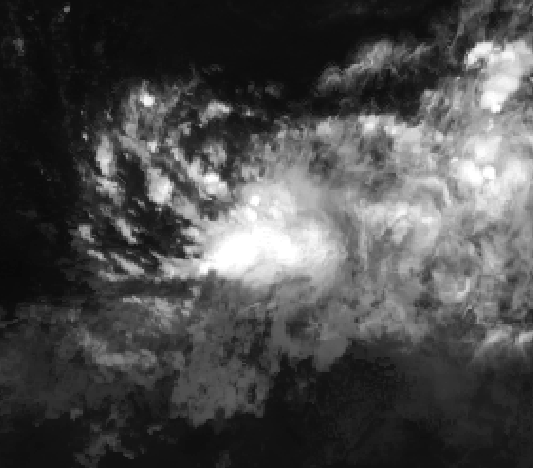 Area 1 is showing some signs of organization, shown by the black lines, which indicate a turning or spiraling of the clouds. 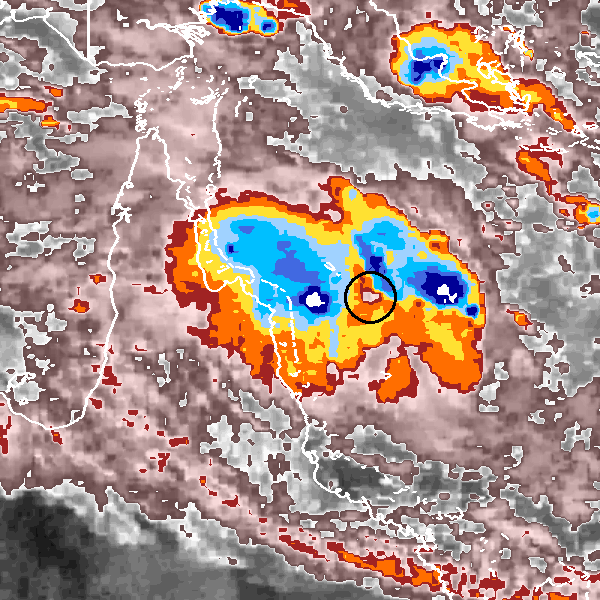 Little organization is seen in area 2, which is essentially a large blob of thunderstorms at this point. 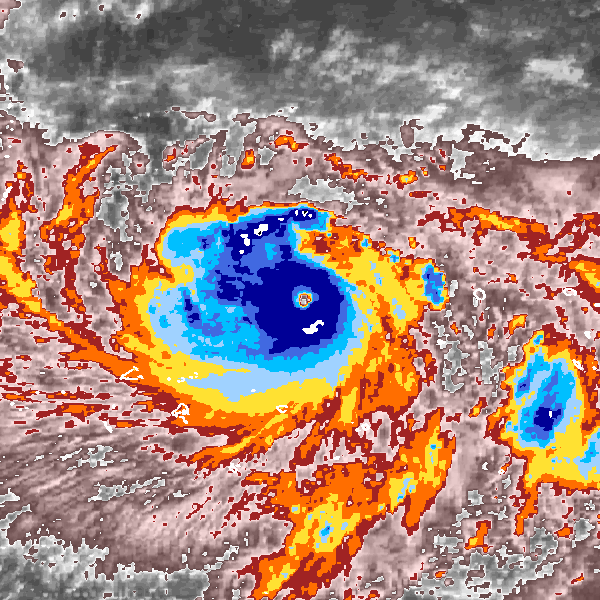 The eye in the middle is actually just a gap in between the 2 systems – there is no organization in clouds around this area. I classified area 1 as a spiral band pattern. The center of area 1 is probably very close to the circled area (follow the black lines in). Since we are only classifying one system at a time in Cyclone Center, I ignored area 2. To contrast the two examples above, lets look at a real eye. 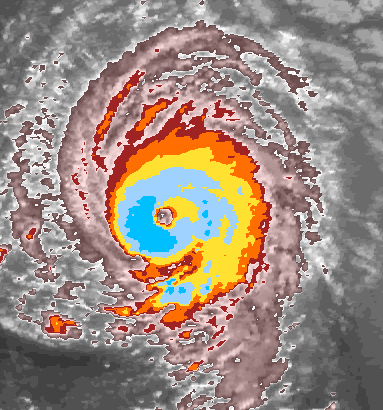 Keith was a very strong tropical cyclone that exhibited a well pronounced eye feature. 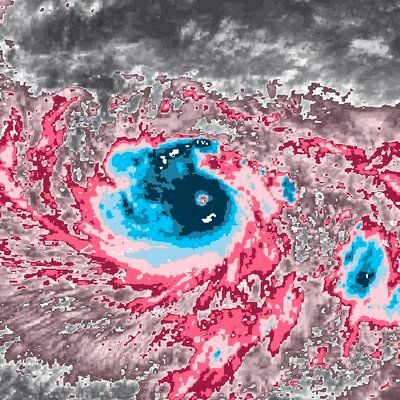 At first glance we immediately notice the features of an eye pattern storm: distinct spiral band features, high degree of symmetry, and cold/circular clouds completely surrounding the eye. 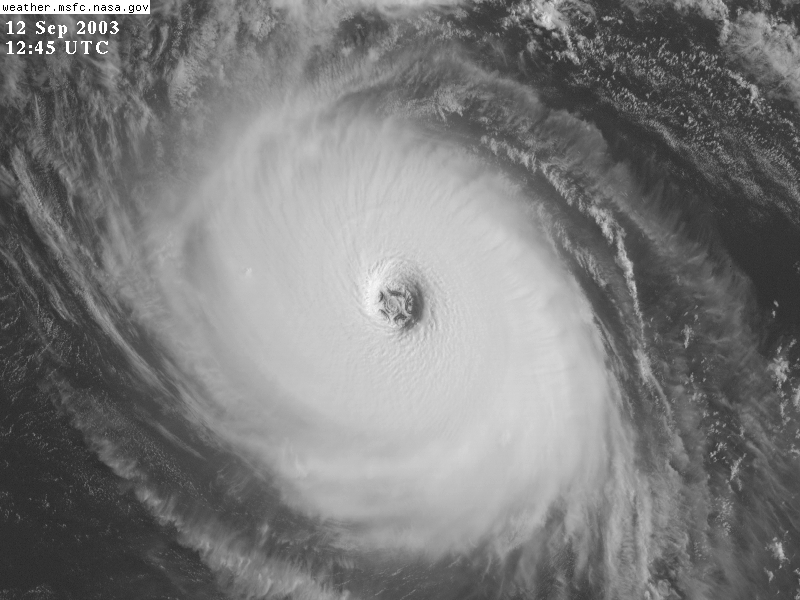 Although there are even better examples of eye storms, I would classify this image as a mid-level eye pattern. 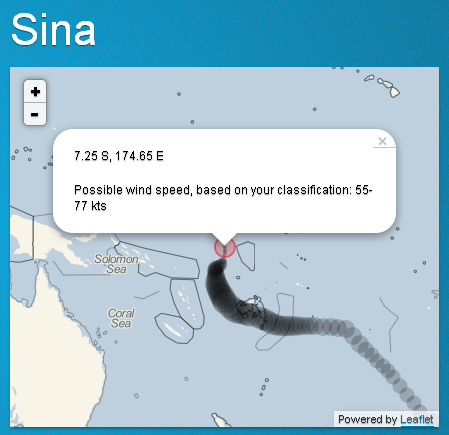 The storm intensity is probably in the Category 2 to Category 3 range on the Saffir-Simpson scale. I hoped that this helps you to become a better Cyclone Center classifier. Look for more help articles like this on a more regular basis throughout the next few months. Ever wonder why some imagery looks nice and other looks blotchy (for lack of a better word). 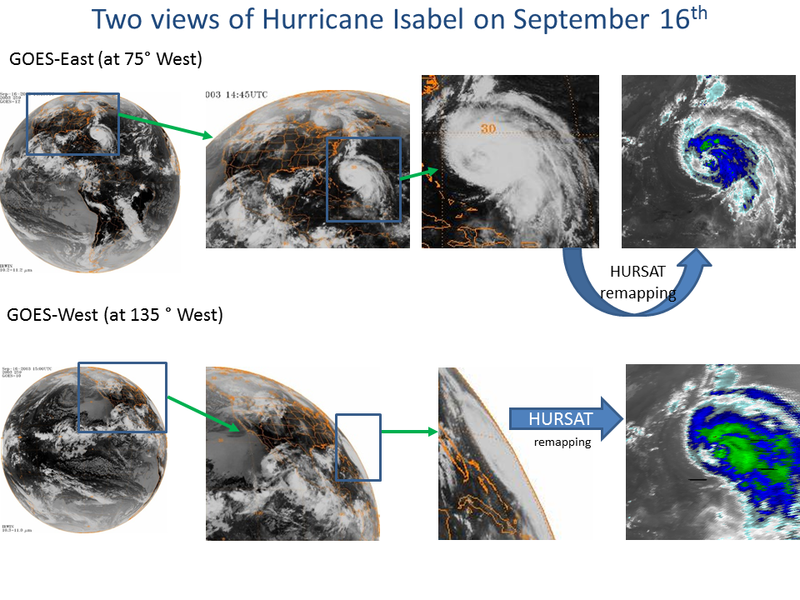 The difference is where the cyclone is with respect to the satellite. The following demonstrates the difference between a satellite that is “close by” and one that is barely visible.